Christian Youth in Action (CYIA) is a missionary training program dedicated to the training and spiritual development of committed Christian teens who want to evangelize children through 5-Day Clubs, Party Clubs, and year-round evangelism. Christians, ages 14 and up (13 year olds will be considered case-by-case) who desire to grow their relationship with the Lord. Each missionary must meet the application requirements and successfully complete the required training. Children are reached with the Gospel. Missionaries’ lives begin to change as they participate in God’s work. Missionaries become exposed to missions, perhaps for the first time, and develop a greater burden for the lost. Missionaries’ skills are sharpened in the areas of leadership, communication, team work, self-confidence, and responsibility. Missionaries are better equipped to serve in their local churches, schools, and vocations. Typically, CYIA’ers teach 5-Day Clubs, which are held for 1 to 1.5 hours all week long. 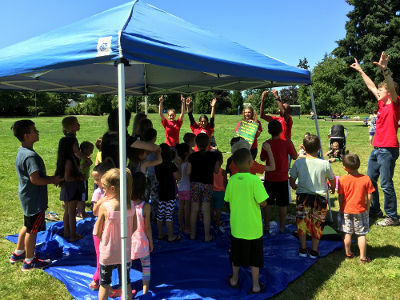 Clubs include Bible lessons, memory verses, games, songs, and a missionary story. Recently, CYIA has begun to include Party Clubs that may be held any time of the year and are centered around a party theme. Clubs are held in daycares, parks, after school programs, and many other neighborhood locations! Each CYIA applicant will go through training that will prepare the missionary to present the Gospel very clearly on a child’s level, guide a child in understanding how to receive Christ as Savior, know how to present an effective Bible lesson, teach memory verses and songs, and lead games. Missionaries are taught how to manage 5-Day Clubs and Party Clubs from start to finish as well as how to work as a team player. What Have Others Said About CYIA? Contact Tyler Williams at 972-470-0008 (office) or 903-243-5487 (cell). Alternatively, email Tyler at ceftwilliams@gmail.com.